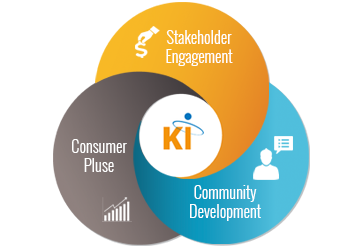 Karvy Insights (KI) combines vast experience and expertise to provide targeted market research solutions. We apply qualitative research techniques and integrate quantitative approaches to solve complex business challenges and meet community development requirements. Our legacy of being part of India’s leading financial services organization with a successful heritage of diverse clients, technology solutions and our understanding of the Indian consumers pan India, is the foundation of our inventive thinking and service offerings. Our name derives inspiration from the term Prana as known in India, similar to the Chinese Chi or Japanese KI and denotes the circulating life energy, inherent in all balancing forces on Earth. Our strategic aim is to be the vital force behind critical business decisions. So the core is about treating insights as a dynamic, flowing/ evolving essence that can sustain and grow marketing efforts. The research teams at KI have decades of rich expertise in diverse businesses and have attained success in incubating companies that grew from seedling to self-reliance, as well as partnering clients to ensure that their brands stay ahead or take on the competition successfully. We provide diverse research solutions, responding to a variety of organizational needs and goals. Whether it is the need for exploring new markets, targeting newer consumer segments, expanding product lines, or simply enhancing customer service/ interface, we help you avoid the guesswork and eliminate arbitrary decisions. Our scientific approach, tech applications and reliable expertise ensure decisions are insight driven and outcomes are impactful. Our experience ranges across several industries including consumer packaged goods, financial sector, automotive industry, media companies, government organizations and all industries that are facing rapid change and relentless automation.